An easy, delicious and fun recipe that is sure to be a complete crowd pleaser! 1 loaf french bread, sour dough works great too. 2-3 Tbsp. milk, add more if needed to reach desired consistency. Slice french bread to make ½-1 inch sections slicing almost all the way to the bottom of the loaf. Be careful not to cut too far or to cut through. I used a serrated knife and cut on inch slices all the way down the width way of the loaf. Then I used my kitchen sheers to snip the ½-1 inch sections on each row, just to avoid any of them tearing off. Place loaf on cookie sheet. In a small bowl, combine white sugar, brown sugar and cinnamon. Stir to evenly mix together. Set aside. Evenly pour and distribute melted butter between each of the sections, making sure to get in-between each one. Trust me you want the buttery goodness :) If you need more butter, simply melt as much more as needed. Evenly sprinkle/pour sugar mixture between each of the sections. Rub in to cover them if necessary. Be care not to tear any of the sections. 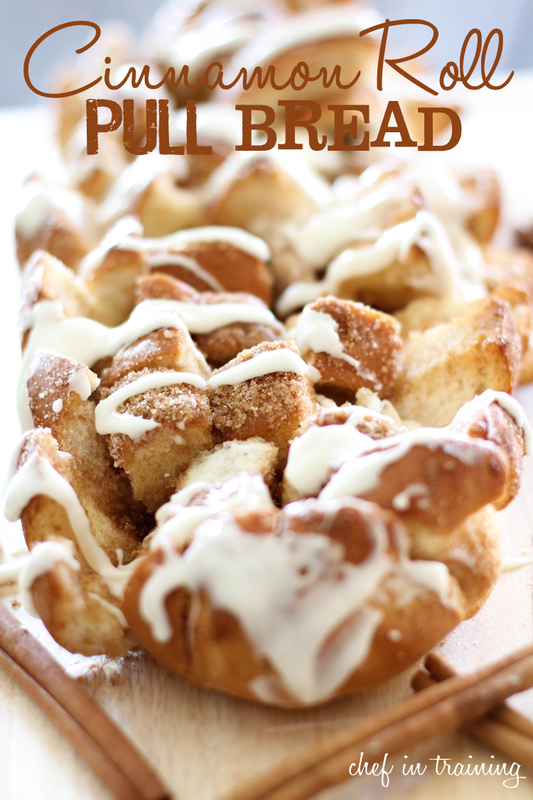 While Cinnamon Roll Pull Bread is baking, make the glaze. Combine all ingredients in a medium bowl and beat until smooth. Add more powdered sugar/milk as needed to reach desired consistency. Drizzle as much as desired over warm bread. Serve warm.